21/01/2019 - 'VirtualRPC in Use' Supplements 3rd Edition now available. 02/11/2018 - 'VirtualRPC in Use' 3rd Edition now available. Increasing the amount of RAM allocated to RISC OS. A fairly serious fault with some white disc versions of VirtualRPC (numbers 12019-VRP to 12028-VRP inclusive) was reported to us this week. After testing we have determined that those versions of VirtualRPC were assembled with a faulty HostFS component. 13/01/2015 - Technical Support Assistant for Mac OS X. 12/01/2015 - Reading floppy discs on PCs or Macs with no floppy disc drive. Virtual Acorn allows you to run the Acorn operating system RISC OS on a Windows PC with Windows 2000, XP, Vista, Windows 7, Windows 8 or Windows 10. You can also run RISC OS on a G4, G5 or Intel Mac with Mac OS X 10.4 or later. Any RISC OS programs can then be run on the PC/Mac. VirtualAcorn can operate inside a window, just like any other Windows application, but can also run full screen. In full screen mode the PC looks and feels just like an Acorn computer. VirtualAcorn requires no extra hardware to be fitted in your PC and can be installed in minutes. An appropriate version of the Acorn RISC operating system. Complete HTML RISC OS user manual with EasyStart front end. Virtual ADFS hard disk drive with the latest !Boot sequence. Facility to read Acorn floppy discs and CD-ROMs. Power management and networking support. Bundled ROM based applications such as !Paint and !Draw. Full commercial versions of Ovation, DrawWorks and Mr Clippy. 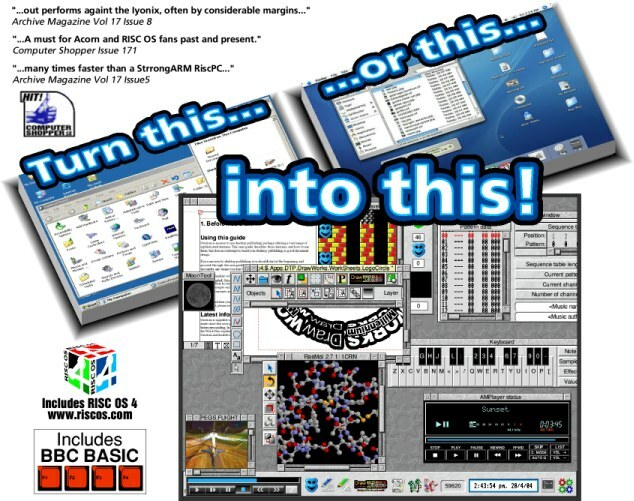 Sample software packs of Public Domain, Freeware and Shareware programs. Pre-configured memory settings which allows VirtualAcorn to run "out of the box". Access to the many thousands of RISC OS applications available. VirtualAcorn really is the best of both worlds. You can run the operating system you want, RISC OS, on cheap fast modern hardware. Why have two computers, when you can have everything you need in one? Customers should note that VirtualAcorn products require an unlock code before they can be run. You will need to install the software then contact VirtualAcorn with your unique Product ID and serial number. We will then provide an unlock code, currently we are only able to provide codes during normal office hours.